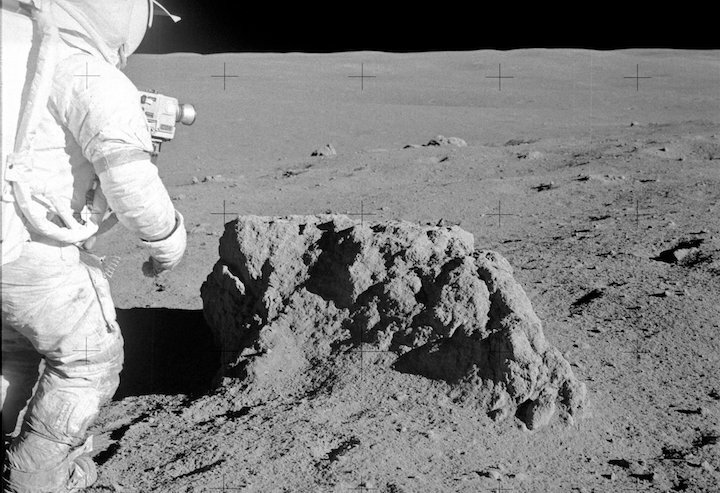 Moon dust clings to clothing and poses serious health risks to astronauts, a new study finds. In space, they say, no one can hear you sneeze. But Apollo 17 astronaut Harrison Schmitt was doing a lot of that inside the Challenger command module when he visited the moon in 1972. One day, after a lunar walk, Schmitt accidentally breathed in some of the abundant moon dust that he and his commander had tracked back in to the Challenger living quarters. For a full day, Schmitt suffered from what he described as "lunar hay fever." His eyes watered, his throat throbbed, and he broke into a sneezing fit. No, Schmitt wasn't allergic to the moon. NASA scientists now understand that pieces of moon dust — especially the smallest, sharpest particles — pose clear health risks to astronauts. A recent study published in the April issue of the journal GeoHealth examined exactly how dangerous that dust can be on a cellular level — and the results are as ominous as the dark side of the moon. In several lab tests, a single scoop of replica moon dust proved toxic enough to kill up to 90 percent of the lung and brain cells exposed to it. Dust on the moon behaves a little differently than dust on Earth. For starters, it's sharp. Because there's no wind on the moon, the dust never erodes. Instead, grains of moon dust — which are largely the products of micrometeorite impacts — remain sharp and abrasive and can easily slice into an astronaut's lung cells if breathed in too deeply. On top of this, moon dust can float. With no atmosphere to protect the moon from constant bombardment by solar winds and the charged particles they carry, lunar soil can become electrostatically charged like clothing with static cling. "This charge can be so strong that the soil particles actually levitate above the lunar surface," the authors wrote in the new study. From there, it's easy enough for dust to cling in the nooks and crannies of an astronaut's spacesuit and follow him or her back inside living quarters. These loose particles can clog sensitive equipment, jam zippers, ruin clothing and — as Schmitt discovered — wreak havoc on the human body if accidentally ingested by astronauts. In their new study, a team of researchers from Stony Brook University in New York wanted to find out just how dangerous a lungful of moon dust could really be. Because actual lunar soil is hard to come by on Earth, the team used five Earth-sourced simulants to represent the dust found on various parts of the moon's terrain. The simulants included volcanic ash from Arizona, dust skimmed from a Colorado lava flow and a glassy, lab-made powder designed by the U.S. Geological Survey for use in lunar soil studies like these. The team gauged the effects of moon dust on human organs by mixing their soil samples directly with human lung cells and mouse brain cells grown in their lab. The scientists ground each soil sample to three different degrees of graininess, the finest of which was just a few micrometers wide (smaller than the width of a human hair) and easily capable of being sucked up into human lungs. When the team took stock of their cells 24 hours later, they found that every soil type had caused some degree of brain and lung cell death. The finest-grain samples proved most lethal, killing up to 90 percent of the cells that had been exposed to them. Cells that weren't decimated outright showed signs of DNA damage that could lead to cancer or neurodegenerative diseases if not repaired, the researchers wrote. "Clearly, avoidance of lunar dust inhalation will be important for future explorers," the authors wrote. But as humans explore the moon in future decades, chance exposures are likely, the researchers wrote. Fortunately, NASA has taken this problem seriously for a long time and is developing several dust-mitigation methods. One promising strategy: Cover sensitive surfaces with an Electrodynamic Dust Shield — essentially, electrically charged panels that shoot currents through thin wires to zap dust away. Early lab tests have shown that the shields work well, and some sample panels are currently being tested on the International Space Station. Whether the panels could be incorporated into astronauts' spacesuits remain to be seen.